Large Storms to Make Travel Difficult This Weekend Across U.S. If you’ve been following the news in and around Denver this weekend you’ve probably notice that initially many outlets were calling for a white Christmas. Seemingly though, a lot of those outlets have backed off snow and some have eliminated the chances all together, but why? 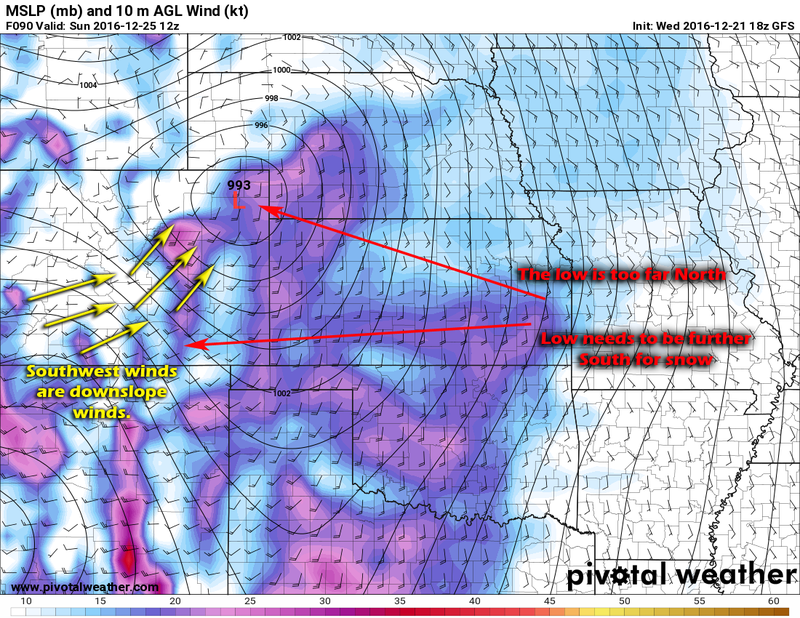 The GFS has begun to consistently show a strong downslope signal along the front range for this weekend’s storm. 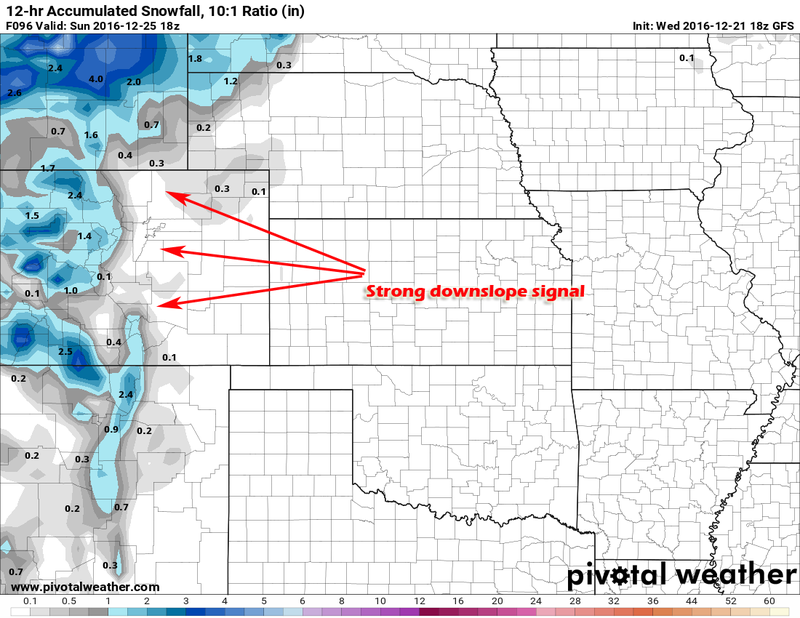 As you know if you’ve followed us for awhile, downslope is the enemy of the snowstorm for us along the front range. 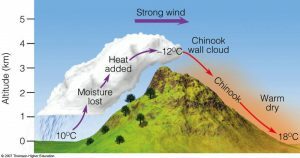 Strong Westerly or Southwesterly winds race down the mountains, warming (from compression) and drying as they decline in elevation. This is called downslope or a “chinook” wind event, quite common along the front range of Colorado especially with large storm systems that come out of the West or Northwest. Chinook means “snow eater” by the way. It is called as such because the warm and dry winds can quickly erode any remaining snow pack on the ground. I don’t see it being particularly warm this weekend but it won’t be super cold. The main takeaway here is that the low being where it is, will cause the air to dry as it moves down the mountains so any moisture will have a tough time making it with the dry atmosphere. If we wanted a bigger snow event we’d want the low to shift to the Southeastern corner of the state (as seen above.) 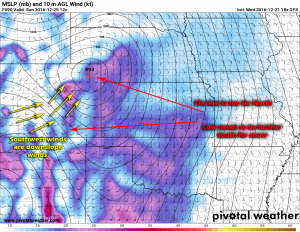 The low being in the position it is predicted to (too far North) means strong Southwesterly winds will form along the front range. 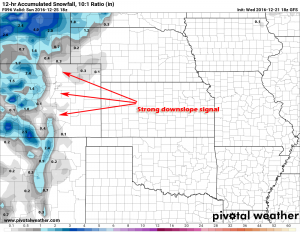 Last weekend’s storm showed a strong signal for snow bands to develop East of the Divide. 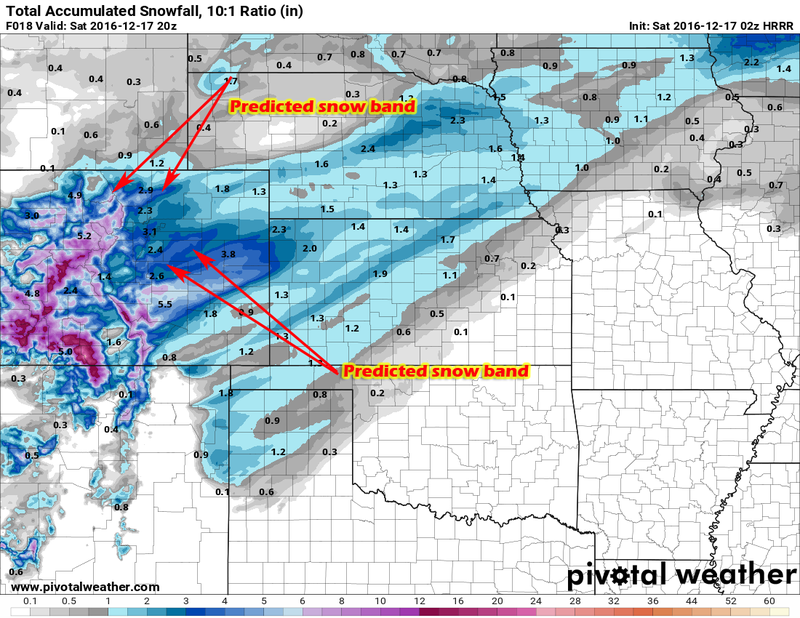 Last weekend’s storm showed snow banding East of the Divide. The jet stream was also directly overhead, meaning any energy and moisture was “boosted” a bit due to the high winds aloft. The low being further North means areas North and Northeast of Colorado will likely see the biggest impact from this storm. So, White Christmas or Not? At this time it’s too early to tell, we still have more questions than answers with this storm system. I can say I’m not terribly impressed with this storm (but then again I wasn’t with the last and look what happened.) At this point in time, it’s just too early to tell, we could see a major shift by the models to the South or a stronger jet stream setup over the state. If any of those two things were to happen it would drastically affect our forecast, as such I’m not giving out any snow totals for any areas just yet. White Christmas… snow falling on Christmas Ever or Christmas Day? Mountains will definitely see the best of the snow, but even they won’t see a ton. 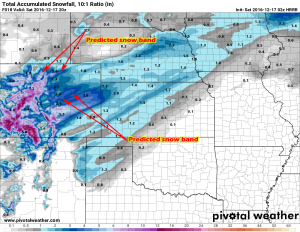 Front range (East of the Divide)… we will have to wait and see how that low sets up, if I had to say anything right now I’d say a dusting to maybe 2 inches into Sunday morning max with this data. I’m still relying on the GFS and EURO models at this point, both are in pretty good agreement with taking that low too far North for us. I’ll be watching closely over the next day or two as some of the shorter range, higher resolution models come into scope with this storm system. I’ll be sure to pass along any changes over the next few days, stay tuned!